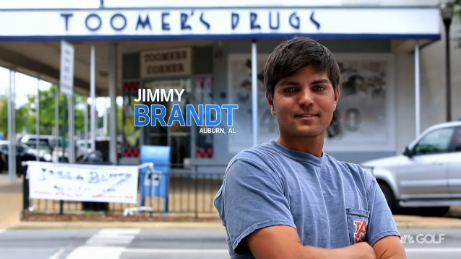 Jason Dufner, Jimmy Brandt… More like Sweet Auburn, home of professional golfers. If Auburn resident Jimmy Brandt does end up going as far in the golf life as he thinks he can, he may actually need to end up thanking his former Auburn coach after all. Brandt, who graduated from Auburn in 2008, seems to think he was kind of done wrong by AU’s golf program back in the early 2000s. And it still motivates him. Despite playing with a chip on his shoulder (double badum! ), Brandt obviously is devoted to his alma mater. The first minute or so of Meet the Players video, which aired a week or so back, is pretty much nothing but b-roll of Auburn landmarks. Brandt has competed in several Web.com Tour events, and a bunch of other impressive stuff. And his dad is his caddie. Big Break: Myrtle Beach premieres Tuesday, Oct. 7 at 8 pm (CST) on the Golf Channel. Related: Fore Eagle! Auburn fan Zach Manning describes the moment he found Rory McIlroy’s tee shot in his shorts pocket.